In recent weeks, agrochemical giant Monsanto was dealt a major blow: The Supreme Court of California ordered the company to pay $289 million in damages in a lawsuit filed by Dewayne Johnson. The former school maintenance employee developed non-Hodgkin's lymphoma after frequent use of the Monsanto product. His doctors do not expect him to live past 2020. In many ways, the stuff of this highly publicized, controversial capitalist nightmare forms the basis of Shoreham- and Brooklyn-based artist JoAnne Carson's career. Indeed, she writes in her artist's statement that "the shift from 'organic' to 'synthetic' nature is a defining factor of our age" and "the knowledge that an Arcadian vision is forever in the past is the primary theme of my work." 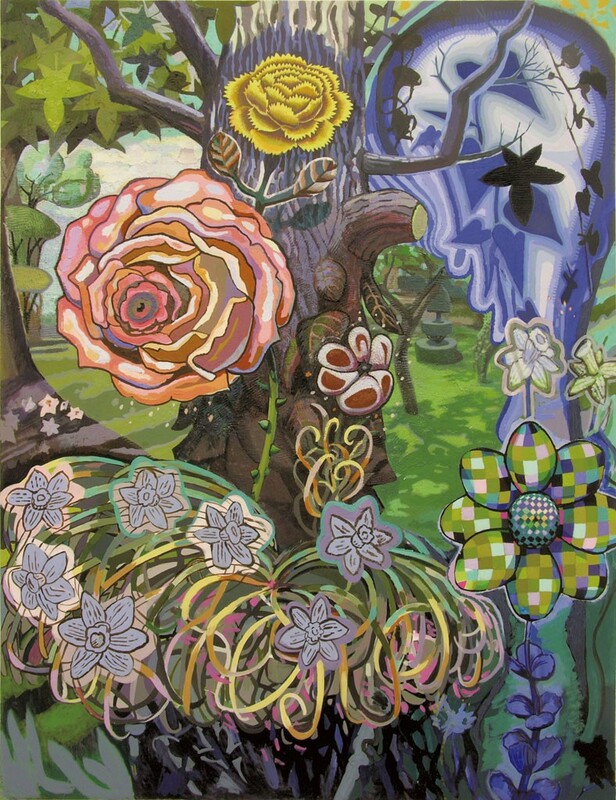 Carson's solo exhibition, "Hyper Flora," on view at Rochester's BigTown Gallery through August 25, features a keen blend of imaginary landscapes, floral portraits and futuristic studies — "at once whimsical and monstrous," as the artist puts it. 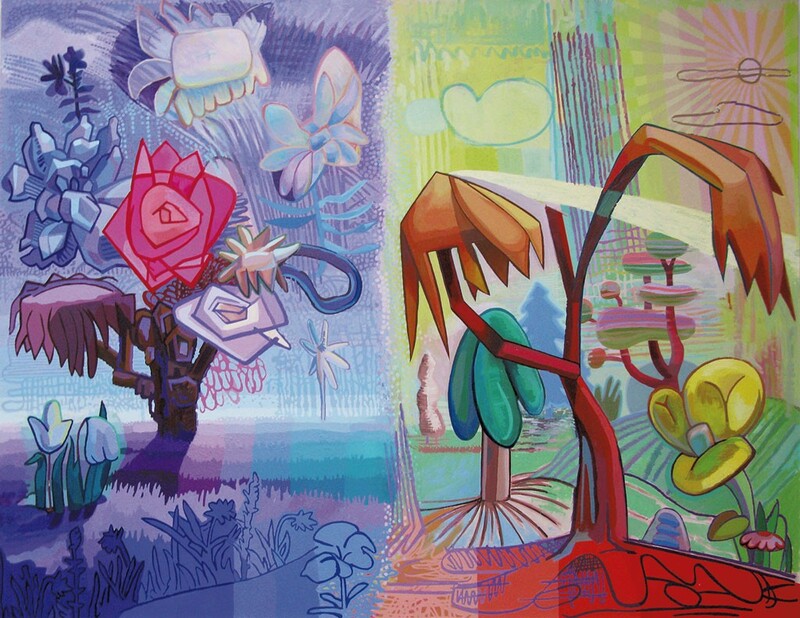 Incorporating painting, drawing and sculpture, Carson constructs a unique and delightfully garish interpretation of both present-day and future eco-scapes. That her works seem to live so comfortably in an ambiguous territory between allure and menace is a definitive part of their appeal. Given Carson's decades-long career — crowned, perhaps, by a 2016 Guggenheim Fellowship — the nine works on display at BigTown are relatively recent. One of the earliest pieces is "Sampler," a 2007 sculpture of fabric, fiberglass and aqua resin. Jubilantly colorful, "Sampler" rises more than five feet tall with a festive conglomeration of fabric flowers that appear to be held by, or grow from, a purplish slug with legs. Compared to Carson's first venture into sculpture, 2001's ice-blue, wedding-reminiscent "Bouquet," now in the permanent collection of the Brooklyn Museum, "Sampler" is much more cartoonish. It's a self-aware caricature with big, visible stitching and the colors and shapes of a children's book. Carson frequently uses leggedness as shorthand for mutation and interstitial states of being. 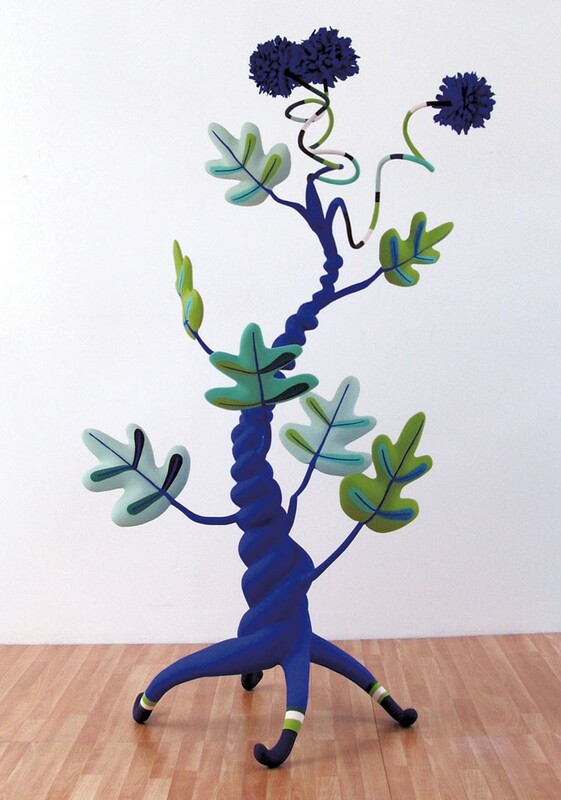 Her other sculpture on view, "Blue," is more than seven feet tall and sports four legs, which sproing upward into a spiral with leafy and pom-pom-esque offshoots. It is Seussian, without a doubt. Carson's drawings, two of which are included in the show, form a visual and conceptual stepping-stone between her sculptural works and the five paintings on view. The color pencil "Sunspots," for example, presents a sculpture-like biological form: a knobby trunk that blooms into flowers, which look almost computerized. Carson uses this digital aesthetic amply in her paintings. The drawing's titular sunspots, faint concentric rings of color, are echoed elsewhere in later paintings as both soft- and hard-edged color fields. For example, in "Early Spring," the large painting at the gallery's entrance, the primary focal point of the busy canvas is the lower portion of a large tree trunk. One of its branches is severed, and a variety of flowers blooms at the fore of the painting. Some species, such as a pink rose, are recognizable; others are less familiar. In the right-hand corner is a comic-book-esque daisy, but its petals and center are patterned with large, pixel-like squares. Dappled and wonky shading and irregular scale blur the identity of "Early Spring." It seems to exist somewhere between landscape painting and digital collage. The sheer variety of plant life crammed into the frame suggests aggressive growth, a grow-or-die ethos that shuns monocropping and monochrome. Positioned demurely in the background is a tame topiary bush, a nod to the extensive lengths to which humans will go to control nature and its forms. Somewhat sparser in composition is "Knotty Pine," a smaller acrylic painting whose central figure looks like the devil on a stick. Atop a brown tree, its stubby bottom branches cleanly removed, is a wild mop of red foliage/hair from which two cut branches protrude like crazed eyes. A hole in that upper canopy reads like a grinning mouth with branch-fangs. What are we to make of this insane, anthropomorphized plant? Is it a lone survivor of deforestation, hell-bent on vengeance? A benign biological deviant? With humor, fancy and fantasy, Carson's visions of other worlds emerge from the conflicts and contradictions of this one. Akin to Monsanto's profit-driven biological tinkering, she recognizes the human inclination to play God. "My work," Carson writes, "is a salutation to the resourcefulness of living beings and my own delight in playing the role of artist/god in creating new things at which to marvel." The spectacle of "Hyper Flora" is certainly marvelous, if unsettling. By Carson's measure, there is still beauty to be found in humankind's most reckless interruptions of nature. Her world is one that accommodates both the pretty and the freakish — weeds, mutants and all. The original print version of this article was headlined "The Botany of Destruction"